Looking for a round that makes sense on big deer, but can also stop a Bear in the Alaskan wilderness? The .338 Win Mag is that kind of caliber, when loaded into the VOR-TX lineup. 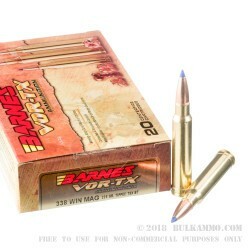 This load offers heavy projectile weight; all copper monolithic bullet design that favors penetration and weight retention; and the clean powder that burns thoroughly so you can get back on target quickly without a huge cloud of smoke. This is Barnes’ TTSX projectile and it offers a polymer tip to help ballistic coefficient improve and the expansion get more uniform. The TTSX stands for Tipped triple Shock X, which loosely refers to the triple ringed base which lowers pressure sin the barrel rifling and also refers to the 3-fold benefits of the round. We think there might be more than just 3.
the following features make this one of the best hunting rounds for accuracy freaks and reliability sticklers. The reduction in fouling and rifling pressure means that you get smoother performance and less cleanup with a longer barrel like. The all copper bullet retains 99%+ of its weight, which manifests in a bigger bullet because of the lower density of copper. 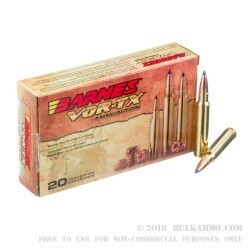 The Polymer bullet tip achieves much better flight stability and sheds more wind. The resulting trajectories are flatter and more consistent. 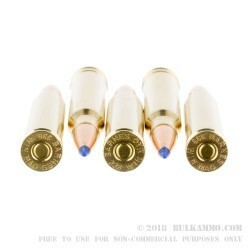 Q: Are these cartridges interchangeable with the .338 Lapua? 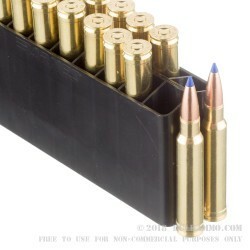 A: No, these .338 Win Mag cartridges are not interchangeable with .338 Lapua cartridges.